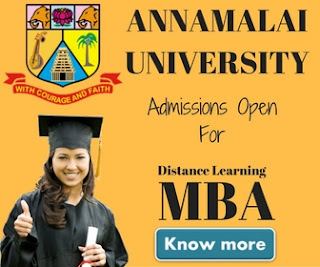 Alagappa University Distance Education MBA 2019: Alagappa University offers 2 years distance education MBA courses through correspondence & study centers. Alagappa University is a State University founded in 1985 & located in a business town of Karaikudi in Sivaganga District in Tamil Nadu, India. The university has been re-accredited with 'A' Grade by NAAC. Along with various full-time regular courses, the university also runs various distance learning courses under the department of distance education (DDE). 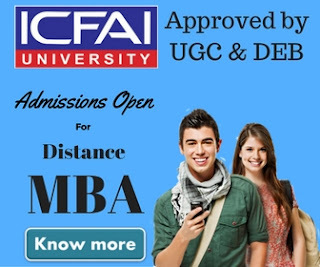 The most popular distance education course offered by Alagappa University is MBA. The university offers one general MBA & 10 other specialized MBA Programs. For more information on MBA Fee structure & how to pay that, kindly visit MBA Fee Structure page on the university website. You may seek admission either directly to the University or through any one of the approved Study Centres of Alagappa University. A detailed procedure for admission into distance MBA courses offered by the Alagappa University is available on its website http://www.alagappauniversity.ac.in. If candidates enroll through Study Centres the Course Materials shall be sent through the Study Centres and they have to attend the Contact Classes arranged by the Study Centres at their places. The university has close to 225 study centers across south India. The details about all study centers and how to contact them are available on the university's website.